Toss plum slices with 4 tablespoons sugar; place on foil-lined baking sheet. 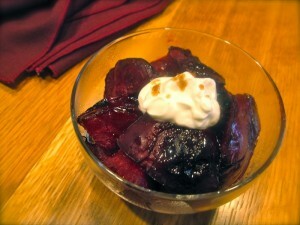 Roast plums until they are soft, 12-18 minutes. Remove from oven and let cool slightly. Spoon plums into individual bowls. Top with a dollop of sour or Devon cream, creme fraiche or plain yogurt. Lightly sprinkle with brown sugar, garnish if desired, and serve.